Look deep into the fire and you will see glowing embers of red and orange. That's what this Sapphire brings to mind with its deep orange to red coloring. The 6x4mm, .45 carat stone is rich with color and sparkle and what a fun vibrant color! Sometimes the color looks bright orange and other times it seems to favor the red tones. Either way, it will catch a lot of attention! And yes, this is a real Sapphire and they do come in cool colors besides blue. Dare to be different! I went wide with the Sterling Silver band to help this stone make a statement. The band is handmade and one of a kind. It is about 10mm wide and isn't your typical circle. I offset the edges of the silver to give the band a unique shape. A tiny silver band circles the wider band, tying it all together. 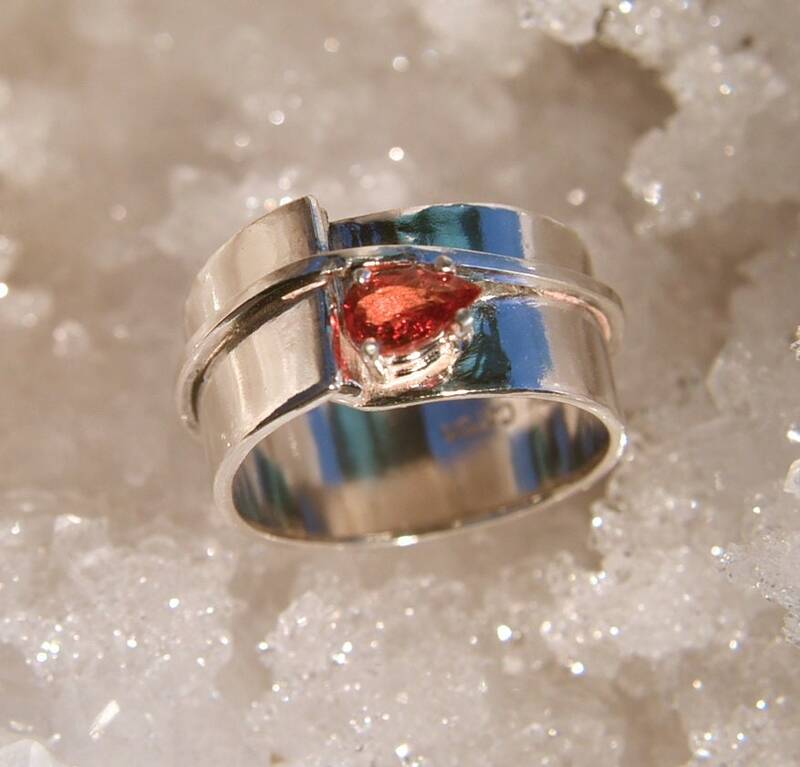 The Sapphire snuggles up to the thin band. Overall, this is a very low profile ring making it easy to wear everyday. Life is too short to wear ordinary jewelry! This ring is a size 7.5. Keep in mind that a wide ring will feel more snug so this might best fir a size 7 finger.